I'm reviewing Functional Programming in C++ book by Manning---a good book for C++ programmers to acquire beginner to intermediate level knowledge of FP in C++. std::visit spews blood when you miss a case in the visitor. See an example. Therefore, language-supported pattern matching is much more preferable than library support for the same. Passing overloaded lambdas to std::visit---the fancy way to create a visitor. User-defined deduction guides for overloading from lambdas. Algorithms implemented using pattern matching style tend to concentrate the entire algorithm in a function as opposed to object-oriented programming style where the algorithm is spread in multiple classes and potentially multiple files. Sharing state become much easier with inheritance as opposed to std::variant based decomposition. Too much ceremony in std::variant approach as you have to call std::visit and pass a visitor to it. In object-oriented style, it is just a call to a function and hence it’s very succinct. Recursive std::variant is not possible without recursive_variant. std::variant is a container not an abstraction. std::variant alone isn’t sufficient to implement algebraic data types or the Composite design pattern. 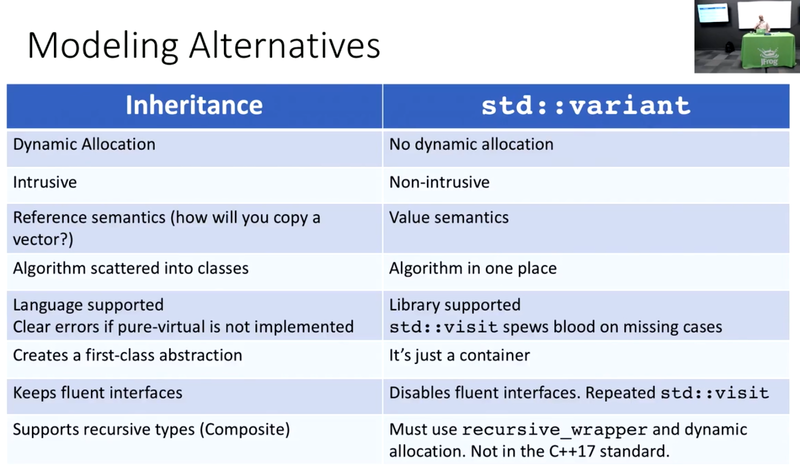 A summary of differences between inheritance and std::variant –based modeling alternatives in C++. Deep Immutability in C++. C++ const is shallow. A raw pointer does not forward const-ness, propagate_const does. You can now implement deep Immutability in C++ using propagate_const. A class containing propagate_const is not copy-assignable. This is consistent with basic C++ rule that a pointer to const can’t be assigned to pointer to non-const. Mutable temporaries in C++. Yes, temporaries can be modified. Modern C++ provides ways to control this. See why you may need std::move(*this);. The Named Parameter Idiom---an example of fluent interface in C++. Avoid constructing unnecessary temporary objects when fluent interfaces are used with immutable objects. How to disambiguate between r-value reference qualified functions and l-value reference qualified functions. *this in a r-value qualified function is a l-value. The trick is to return a r-value reference to *this. Hence std::move(*this), which is a simply a cast. Thanks for sharing, I appreciate you breaking it out into text to save time as well :). Very informative of the new C++ tools available and I look forward to future updates.